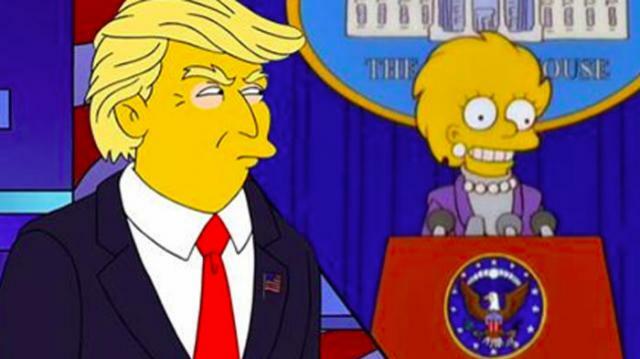 In the episode ‘Bart to the Future’ that aired over 16 years ago, Donald Trump won the fictional race to become President, a story line that had become a reality within recent weeks when the real Donal Trump emulated his cartoon counterpart. This was considered an extremely unlikely event even quite late in the real world election, making the prediction considerably impressive. The Simpsons were able to forecast this from well over a decade away to a high degree of accuracy and writer of the episode Dan Greaney was happy to explain how. The episode revolves around Lisa becoming president after the fictional Trump has left the American economy in tatters. The writers intended this as a ‘warning to America.’ Greaney revealed to The Hollywood Reporter that when writing the episode, he was trying to paint a picture of an American public that has lost its mind, resulting in the worst case scenario, Trump as President. This choice allows Lisa to come in and pick up the pieces as his replacement, the story structure that the episode needed. The Simpsons episode included some details that were eerily replicated in real life. The most noticeable of these was the electoral college board featured in the episode detailing Democrat, and Republican states was an almost perfect replica of the results of the Trump vs. Clinton election. The creator of The Simpsons, Matt Groening has previously agreed with this explanation for the choice of Trump as the fictional President stating that they chose, ‘the most absurd placeholder joke name we could think of at the time.’ The jocular nature of the selection of Trump as president in the episode suggests that The Simpsons staff involved in ‘Bart to the Future’ must have been extremely surprised and amused, first to see Trump selected as a candidate and then as President of the United States. According to a new report by Georgetown Law’s Center on Privacy and Technology, half of Americans now have photos of themselves stored in facial recognition databases. The vast majority of these citizens are not suspects in crimes, nor do they have criminal records. The report indicated that over 117 million adults are stored in facial recognition databases, and any of their photos can be used at any time in a “virtual lineup,” where they can be picked out by law enforcement as potential suspects. According to the American Civil Liberties Union (ACLU), many police departments use photos from Facebook, photos from protests, and even videos of average people walking down the street taken from cameras posted up around urban centers. It was even indicated in the report that drivers license photos are used to populate these databases, meaning that almost anyone could be a potential suspect in one of these lineups. The report’s findings, along with revelations from the ACLU on police monitoring in Baltimore, suggest that the technology may be violating the rights of millions of Americans and is disproportionately affecting communities of color, advocates said. Alvaro Bedoya, executive director of Georgetown’s privacy and technology center says that this new technology presents a massive privacy risk. “Face recognition, when it’s used most aggressively, can change the nature of public spaces. It can change the basic freedom we have to go about our lives without people identifying us from afar and in secret,” he said. The investigation poured through a year’s worth of police reports to determine how widespread facial recognition software has become. Neema Singh Guliani, ACLU’s legislative counsel, pointed out that government agencies have free rein to do whatever they want with this technology, and that they offer absolutely no transparency. “In the case of face recognition, there appear to be very few controls or safeguards to ensure it’s not used in situations in which people are engaged in first amendment activity,” Guliani said.